Previous Post: Letters for a Man Called Reg Next Post: “Retirement Dreams” Snowy Pittsburgh? Sunny Sarasota? BOTH! Pamela Foster grew up in the Pacific Northwest and now lives in the Ozark Mountains of Arkansas with her husband, Jack, and his PTSD service dog, Chesty. 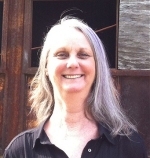 She has written two contemporary novels, a memoir, a humorous travel memoir, and a western. Foster is a strong advocate for veteran's rights. and speaks at conferences and veteran's groups around the country. Please check out her Pamela Foster Speaker Writer and Wounded Warrior Wife blogs. Pamela and Jack's adventures in Panama are described in her Clueless Gringos in Paradise book. In Humboldt County, California where giant coastal redwoods march into the wild waves of the Pacific Northwest. On the side of Kilauea volcano on the big island of Hawaii where new land is created every day and the air fills with sulfur and forces you to the beach out of harm’s way when the wind shifts. In an old RV traveling around the southern U.S taking side roads and exploring the country where we met true American heroes – waitresses and farmers and linemen and bank tellers and postal workers. Beside the Caribbean in a 35’ trailer we pulled the length of Mexico and set up on the beach where we scuba dived twice a day, every day, and loved every single minute of it. In the Sonoran desert of Arizona, where monsoons rush toward you in the spring and rain evaporates in the heat before it reaches the earth. In the country of Panama where just to make it interesting we immigrated with two 150 pound service dogs tethered to our wrists. In the Arkansas Ozarks where lakes abound and the hills are rippled with deep hollers and narrow ridgelines. When you move this often, your riches are not stored in a bank or safe deposit box. You may be wondering why, since every single place we have lived has been beautiful, we continually sell everything – buy high, sell low is our motto – and move on to the next adventure. In ’65 my husband, Jack, stepped on a land mine just outside Danang. There was a lot of that going on back then in that steamy corner of the world. He deals with his physical wounds in a variety of ways including meds and Marine Corp-instilled will power. But it’s the mental shrapnel of that war, post-traumatic stress, that is his biggest challenge. One of the symptoms of PTSD is that even after the trauma is over – of course it’s never really over – a person’s adrenaline levels remain high. This creates a need for adventure, challenge, risk taking. So when the blanket of gray descends over Jack pushing him into isolation and depression and thoughts of suicide, we sell everything and move to a new fresh start. It’s not necessarily a good coping device, but it has made for a life of adventure. Heck, in between moving from place to place, we packed one change of clothes each and backpacked for six months around Thailand, Nepal, and Vietnam. But times change, we all age. There comes a time when sixty-seven pieces of shrapnel become too heavy a weight to bear with Marine Corp Ooorah. Comes a time when fifty years of roaring adrenaline and constant overcoming begins to show its effects on the body and on the brain. Comes a time when the doctors speak words like dementia and irreparable damage. Comes a time to settle into a quieter life. But you’ve already picked up on the fact that Jack is a Marine, right? He will not go quietly into this good night. He will rage against the darkness to his dying breath. As the wife of a Marine, I will plead, and force compromise when I can, and insist on pointing out all the reasons he needs to slow down. But in the end, I will go where he goes. As the heat of summer blesses us, Jack glares at the winter that must follow and makes plans to escape the ice and snow in Chiang Mai, Thailand. Chiang Mai is warm and the people are charming, but can you take your service dogs? I’ve really enjoyed your blogs on PTSD. I’ve learned a lot and hope to see more. My advice: Go, go while you can, before the true old man winter sets in. Then come back to your Ozarks where solid ground and friends await. You continue to be an inspiration, and I count my blessings that along your wide and varied journeys, our paths crossed. We mostly regret the things we did NOT do. Go while you can.